Tuesday's sunbelts primaries in Florida and Arizona shined a light on several of 2018's most targeted statewide races. 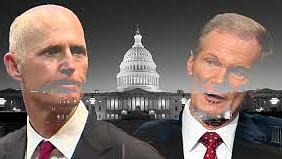 Three-term incumbent Senator Bill Nelson, who was unopposed in the Democratic primary, will face a challenge by Governor Rick Scott, who easily defeated businessman Rocky De La Fuente to win the GOP nomination. Although Nelson last won re-election in 2012 by 13%, he is the only Democrat elected statewide in Florida, which delivered a slight, but critical, 1.2% victory to Donald Trump in 2016. Florida, and its 29 electoral votes, have voted with the winning presidential candidate, regardless of party, in the last six presidential elections. The narrow margins in all cases, most notably the historical 2000 recount between George Bush and Al Gore, underscores the state's political diversity and status as the country's preeminent battleground state. While Rick Scott narrowly won both his gubernatorial contests by less than 2%, his own eight years in statewide office, and his personal wealth, make him a formidable challenger. The former Columbia/Hospital Corporation of America CEO spent $75 million of his own funds to win his first gubernatorial campaign in 2010, and is currently outspending Nelson by more than four-to-one. Democrats will have to invest considerable counter resources to retain the seat in what is now a direct test of President Trump's avid support of the GOP nominee. With the departure of the term-limited Scott from the Governor's mansion, the Florida Governor's seat immediately rose to the top of the Democrats' takeover list. In the biggest upset of the night, Tallahassee Mayor Andrew Gillum took the Democratic nomination with 34.3% over institutional favorite and former Congresswoman Gwen Moore, who garnered 31.3%, and was trailed by five other candidates. 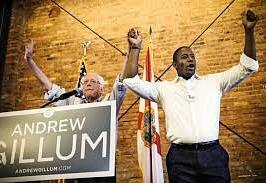 Gillum, the state's first African American candidate for Governor, was endorsed by progressive Senator Bernie Sanders (I-VT) and billionaire advocate Tom Steyer. In the "Toss Up" seat, which has been held by Republicans since 1998, Gillum, 39, will face GOP nominee Congressman Ron DeSantis, who easily won his primary as Trump's preferred pick. (R) will be facing each other in November. In the race to replace retiring Republican Senator Jeff Flake, Democratic Congresswoman Kyrsten Sinema breezed past primary opponent Deedra Abboud with 80% of the vote, and will go up against Congresswoman Martha McSally, the Republican primary victor. McSally, who was not endorsed by Trump (until this morning), won with 52.9% to former State Senator Kelli Ward's 28.2%, followed by former Maricopa County Sheriff Joe Arpaio. Arpaio, who garned only 18.9% of the vote, was famously pardoned by Trump last year for his criminal contempt of court conviction for continuing to racially profile and harrass hispanic immigrants. Although a red state, which delivered a 3.5% win to Trump in 2016, Arizona voters have demonstrated a strong independent streak under the leadership of maverick Republican Senator John McCain for the last 36 years. Its congressional delegation is split, and polling puts the popular, centrist Sinema in a viable position to flip the seat to the Democrats. With two women running in the US Senate contest, Arizona is ensured of electing its first woman Senator to the upper chamber. A July 23-25 ABC/Ohio Prective Poll showed, in a pre-primary matchup, Sinema led McSally by four points, with 8% undecided. Governor Doug Ducey (R) is running for reelection to a second term and is being challenged by Arizona State University professor David Garcia (D) in the general election. Ducey have to tread lightly in his appointment of a temporary replacement for Senator John Mcain, who passed away from a rare form of brain cancer on Saturday. Ducey is likely to agree to a name of the McCain family's choosing. In the open 2nd Congressional District being vacated by Martha McSally (R), former Congresswoman Ann Kirkpatrick (D) emerged from a heated primary battle to go head-to-head with Lea Marquez Peterson (R) in a seat Dems are expected to flip Red to Blue.